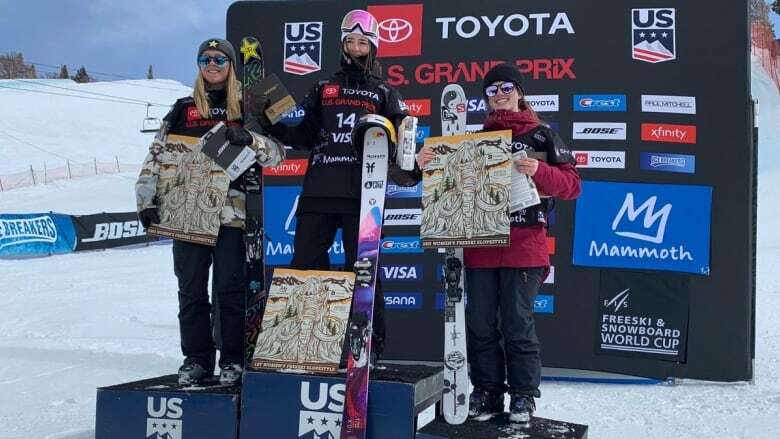 Canada's Megan Oldham soared to a bronze medal in women's ski slopestyle at the World Cup event at Mammoth Mountain in California on Sunday. Oldham, 18, earned her second medal of the season with a 76.15 best-run score, edging American Sarah Hoefflin by less than one point. "This being my first year I'm very excited and never thought any of this would happen so just being on the podium is absolutely crazy, incredible," said Oldham. The Parry Sound, Ont., native also pick up a silver medal at the Italy World Cup stop in January. Switzerland's Mathilde Gremaud raced to gold by racking up 86.15 points, while Norway's Johanne Killi took silver with 79.15 points. Canada's Elena Gaskell finished ninth with a top score of 63.75 points, just ahead of Yuki Tsubota's best-run score of 42.00 that landed the Canadian in 11th place. On the men's side, Canada's three competitors were all within 10 points of the podium. The top finisher, Teal Harle of Campbell River, B.C., scored 83.95 points, leaving him just 1.25 back of third place. Right behind Harle was teammate Max Moffatt. The Caledon, Ont., native's best-run score of 82.05 points was good enough for fifth overall. Rounding out the Canadian results was 17-year-old Philippe Langevin of Mont-Tremblant, Que., who snagged seventh with 75.15 points. American Mac Forehand grabbed gold with 90.95 points. Norway's Ferdinand Dahl took silver at 86.05 points, and Kiernan Fagan of the U.S. brought hom bronze at 85.20 points.